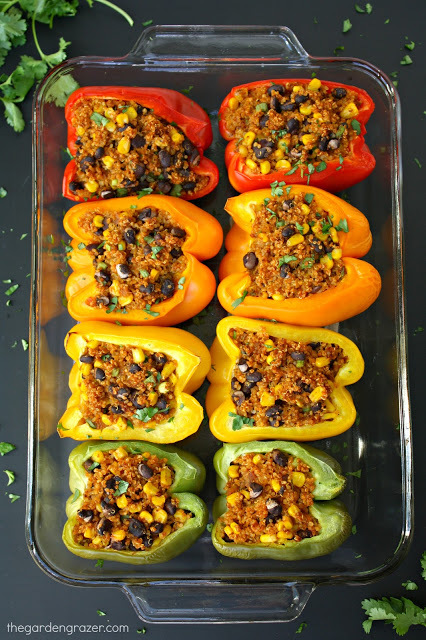 These fun & colorful stuffed peppers are a fiesta for the eyes and the mouth 😉 It all starts with a delicious (and incredibly easy) Mexican-style quinoa filling with tons of flavor… stuffed in a pretty pepper package! By the time it takes the quinoa to cook, you can have everything prepped and ready to go. Then just let the oven do the work! It’s a fun recipe to customize based on your own tastes or what you have on hand. 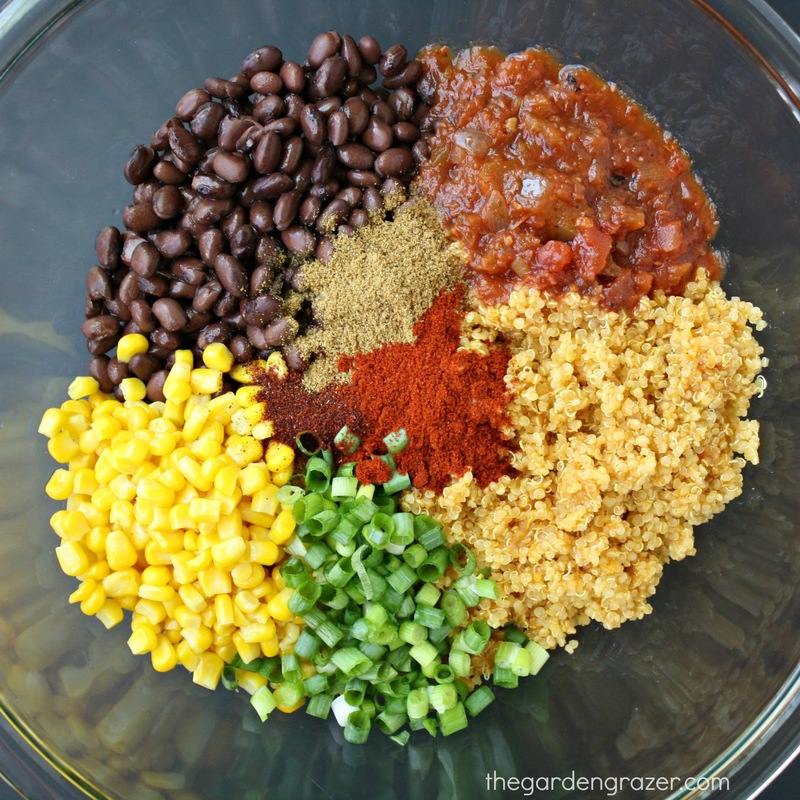 Swap out the black beans for pinto beans, add a can of diced tomatoes for a juicier filling (we love this! ), swap out the quinoa for rice, or add some spice with smoky chipotle, etc. They’re great served as is, or with any desired toppings (guacamole/avocado is my favorite). Hope you enjoy them too – let the pepper party commence! Guacamole, salsa, dairy-free sour cream, hot sauce, etc. 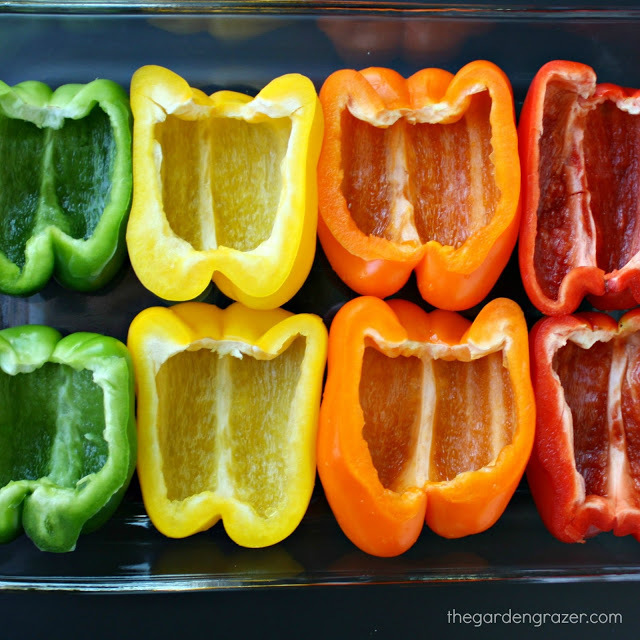 Meanwhile, halve bell peppers and remove stems, seeds and ribs. Rinse and drain black beans, thaw corn, and slice green onions. 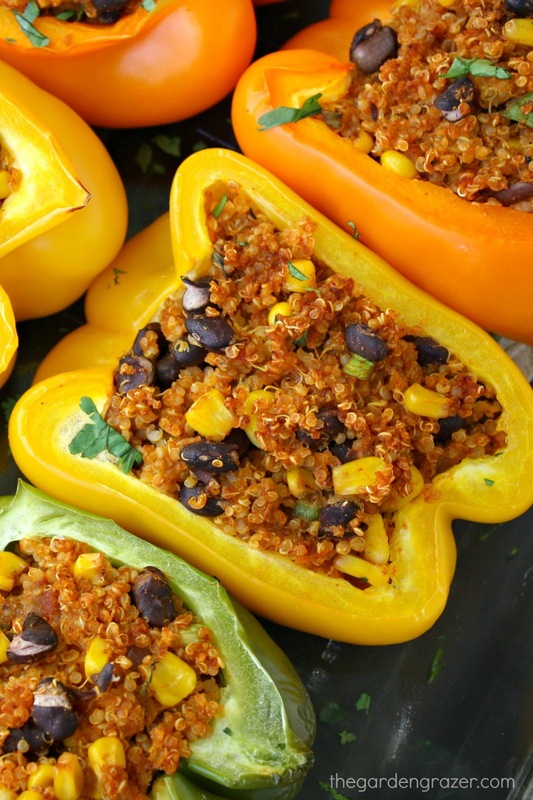 In a large mixing bowl, add cooked quinoa and all other ingredients except bell peppers. Stir to combine, and adjust taste if necessary (salt, more seasonings, nutritional yeast). In a 9×13″ baking dish, place pepper halves, and generously stuff them with the quinoa filling. Lightly press down to compact and fill all the crevices. Cover with tin foil and bake for 35-40 minutes. Remove foil, and bake 10 minutes more. Serve with any desired toppings. what is the nutritional yeast for? Nutritional yeast also has 8g of protein per tbsp. A great way to add protein to a vegetarian dish. Haaaaaa too much cumin! Great recipe but only put a pinch of cumin. It's a very strong spice that should never be used in that amount. To an entire gallon of green chile I add only a pinch. Cumin in small quantities compliments flavor, a teaspoon and a half would OVERWHELM!!!!! To each their own. People's tastes are different. I like the amount given in this recipe. It's perfect for me. You need not express your sentiments here. It's not your blog. No need to be rude. Or attempt to force your opinion on others based on your likes alone. In my opinion, it DOES NOT OVERWHELM!!!!!! A pinch of anything does absolutely nothing! All good cooks know that! There can never be "TOO MUCH" cumin in anything! I keep a minimum of 2 jars at all times! Love cumin! I’ll probably use more than the recipe suggests! I guess we all have different taste buds! Making these today for meal prep! I made them today too!! Delish! New family fave! Thanks for a delish recipe! I found this recipe in my quest for dairy free dinner ideas. It is so good, thank you for sharing. We will be making these again very soon. Hi Katie! Very nice to hear – glad you enjoyed them and are looking forward to making them again! 🙂 Have a great week! Is there a replacement for the yeast? I'm not familiar with it. Nutritional yeast is found in a whole foods/health food store. It is a powdered substance that is used to mimic a cheese flavor. Thanks for answering Jill! <3 I'd recommend trying it Shay! Otherwise you could substitute it with your favorite non-dairy cheese shreds 🙂 Hope you enjoy!! Has anyone prepared the filling 2days before and then put in peppers and baked? Yay! Hope you enjoyed them the other night! We made them a few nights ago too (and I just finished the leftovers for breakfast haha.) Have a great week! Hey there! 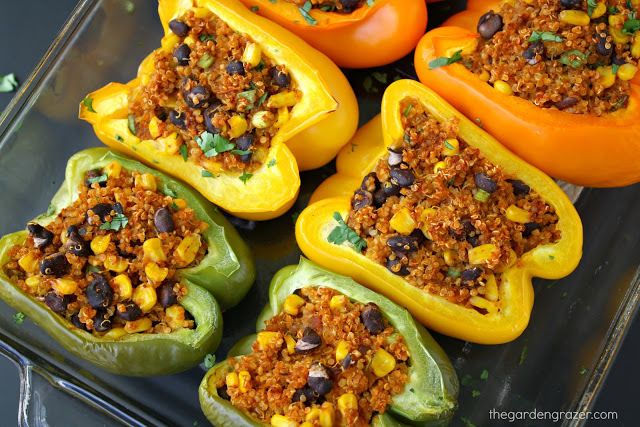 I love stuffing my peppers w/ a quinoa mixture-and I love the idea of using nutritional yeast to keep it non-dairy while getting that flavor! My question is-have you ever made a bunch of these and froze a few? I am trying to fill my freezer w/ some easy healthy weeknight dinners and stuffed peppers would be a welcome addition! Thanks! Hi!! Stuffed peppers are so fun aren't they? 🙂 Personally I've never tried freezing them, but I've heard they do pretty well and hold their shape. Just a guess but I'd probably try freezing them before baking. Would love to hear if you give it a go and how it turns out! Have a great weekend!! 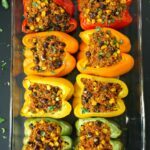 These look awesome I am a vegetarian but my fiance is not I would like to make half this way and half subbing ground beef for the beans. Do you know, should I cook the beef before filling the peppers or just add it raw and it will cook in the oven? Hi! Definitely cook it before filling. Though I'd encourage you to try it all with beans first to see if he likes it! 😉 Lots of meat-eaters end up loving it this way! I made these for dinner tonight and they were delicious! My family loved them!! Do you think I could cook these and then freeze some to eat later? Or would the cooked pepper not freeze well? Thanks for the recipe! Hi! I've personally never tried freezing these, but just read up on freezing stuffed bell peppers and they do quite well! Try cooking them first, then be sure they cool off completely before freezing. And also totally seal them up in the freezer 🙂 Hope you enjoy. Would love to hear how it goes if you give it a try! Do you think rice could sub for the quinoa? Looks really yummy! Hi Janet! Definitely! People have commented that they tried that variation with success 🙂 It's a fun recipe to play around with! I also love adding a can of diced tomatoes for a little more juice/flavor. Hope you enjoy!! What do you serve these with? I would like to make them for my family but am trying to think of sides that would complement. OMG, this is good and I even made extra to freeze. I have only been eating a plant based diet for a couple of years. 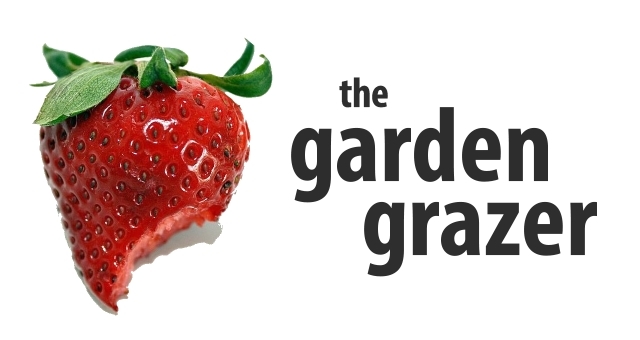 Your recipes are so helpful, easy, tasty.Thank you for sharing. You are a great cook and teacher. I'm allergic to quinoa, so I replaced it with a mix of cooked brown and white rice and my kids loved it. Thanks for the recipe! Made them tonight for dinner. I added shredded chicken. DELICIOUS!! Yay! Glad you enjoyed this recipe too, Jackie! <3 YUM to the peas addition!! These were really tasty. Great recipe. I am making these for the second time tonight. My daughter is vegan, so she is the reason we tried it the first time. Per her request, I'm leaving out the smoked paprika (we figured out it was the smokiness she disliked) and I will be cooking them in the crockpot to make them extra tender. Can't wait! I just made these for myself and my two 6 year olds…. The verdict…… These are amazing! My kids devoured them. Wish I found this receive sooner!! Awesome!! I love when it’s a meal everyone can enjoy 🙂 Appreciate your feedback! Hope you all have a beautiful week! I made this and It came out pretty good…I did need to add some guacamole on top for a little something extra…next time I may try some homemade red sauce with it. Overall very good though! This was such a tasty dish! I used brown rice instead of quinoa. Diced tomatoes, fresh cilantro, and fresh jalapeños instead of salsa. I added some sautéed onions and mushrooms to the mix and I topped mine with some vegan mayo mixed with Trader Joe’s spicy Zhoung sauce. So delicious! Will be posting to my instagram page and will definitely tag you! Can’t wait to try other recipes of yours.